is a vocational author with a strong interest in individual-collective learning. She was introduced to systems thinking by Charles François, who wrote a commentary essay on her first book “Un Camino a la Abundancia” (A way to abundance). A book about the paradigmatic challenges the planetary community faces. 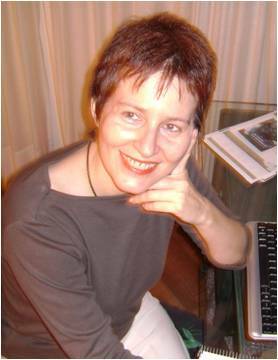 Silvia is the current Secretary General of GESI (Grupo de Estudio de Sistemas Integrados Civil Society Organization) – Argentina, one of the most active regional entities in systems methodologies research and dissemination. She is founder of the Group “Economía Amable”, which she coordinates with Mechthild Adameit. As an economist her field of experience is the banking industry, were she was in charge of business portfolios management and credit risks management of medium and large companies from a wide range of activities. There she learned to assess organization´s behavior patterns that contribute to their perdurability and success. She grew up in a farmhouse in the area of virgin forests in the northeast of Argentina where she learned to appreciate the web of life pulsating in nature. This is substantive in her engagement to develop an “Economía Amable”: an economy, kind to people & nature. It is an adventure in the sense that each query, each step, each interaction somehow adds to the emergence of something new, unforeseen. We live in a time of huge changes: the birth of a new world out of an old one. Actually we live in both of them. The old hasn’t gone. The new one tries to gain presence. My chosen field offers me an active and conscious participation in the profound transformation process which is taking place in our planetary society. The planetary society has changed much in the last 500, 200, 20 years. How much will it change in the next 20, 200, 500 years? In what world will we live in the future? In the next hour / millennium? Past-present and future are closely intertwined. Future studies and future creating play a key role in a highly complex world. We are protagonists. What is our personal/social role in fostering that what will be? I would like to see old boundaries gone. Much more creative collaboration among science and art, different disciplines, theory and practice. This will offer the freedom to enhance the value of contributions. I do know that I owe much to others. Among them are authors, thinkers and people of action I never met, but feel very connected to. They have something in common: all of them offer clues to overcome restrictions and challenges. Mahatma Gandhi, Nelson Mandela and Pope Francis are examples. I admire and respect profoundly several authors / thinkers. It is worth to mention that to me in the systemic world the writings of Fritjof Capra were a discovery: one can dive into different fields weaving valuable traces of an emergent vision of reality. Later, Edgar Morin opened for me the door to the “Spirit of the valley”: a true scientist is openminded, humble; and more, he includes himself in the picture. Then, sometime ago, as I read Basarab Nicolescu’s “Manifesto” I felt amazed by his poetry and vision: transdisciplinarity offers unexpected possibilities for the emergence of a new set of references to enhance co-evolution. There are others who I personally know: the people (and other beings) of my daily life. They too inspire me a lot by their particular ways of to be. They teach me what no book can teach. One of them is Ana María Bovo who dominates the art of storytelling and shares its secrets generously. By doing so she opened for me the doors to enjoy with a new attitude the ups and downs of everyday life. As a result now I am able to extract the richness from whatever happens in my micro-macro world. What fascinates you about “Economic system change”? In your own words: Why should people go there? As I don’t like to worry, but find the current challenges humanity faces are extraordinary complex and delicate I engaged myself in a search for a promising horizon. This happened many years ago. Walking the path I tried different walks only to confirm it is not a small issue. Our values and modi operandi are outdated with respect to our present circumstances. Sustainability is important for each one of us, but has no appeal for the majority: one has to face the fact that the human specie is loosing its ground. Denial is a natural response to what a human being finds too hard to overcome. What about using prospective imagination? It is a powerful tool for inspiration and creativity. In this gathering we are going to converse desirable changes guided by a future scenario where all the delicate challenges we are facing today don’t exist anymore. If you are a curious person who would like to envision and assess the best possible future scenario please attend our Symposium.